For security reasons, you should set a strong root password for the MySQL server. If you have not set a MySQL root password already, you should be promoted to do this during the installation of the mysql-server package. 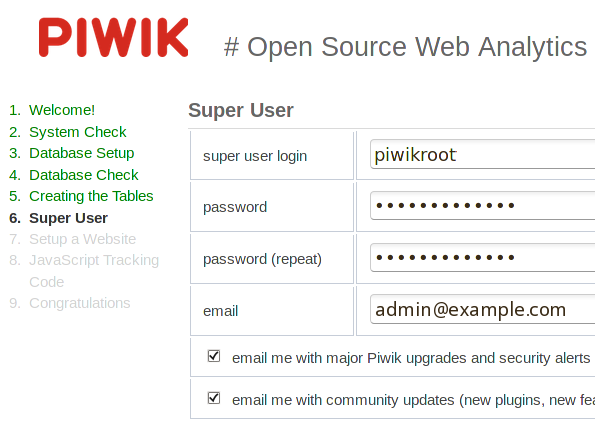 Piwik uses a MySQL database which must be created manually before you can use the Piwik web interface. See http://piwik.org/docs/ for more details of Piwik installation and configuration. By default, Piwik uses browser language settings to guess the countries in which your station's audience is physically located. In order to satisfy broadcast regulators and music royalty collection societies, a more accurate method is required, based on the location of individual IP addresses. 4. In the Piwik web interface click Settings in the top right corner, then Geolocation in the left side menu. Change the setting from Default to GeoIP (PECL) . 5. Optionally, configure Setup automatic updates of GeoIP databases at the end of the Geolocation page. The ServerName of your Piwik installation. Number of the default site configured in Piwik. How many threads to use while parsing the log file. To begin with, set this value to the number of CPU cores you can spare on the Piwik server. Collect statistics for errors, such as stream links not found. Used because any characters requested by the client after the Icecast mounpoint URL can confuse the statistics. The script will report the number of records processed and the time that has been required to parse the Icecast log file. If the import script is taking too long to execute, there are performance and configuration tips in the https://github.com/piwik/piwik/blob/master/misc/log-analytics/README.md file. 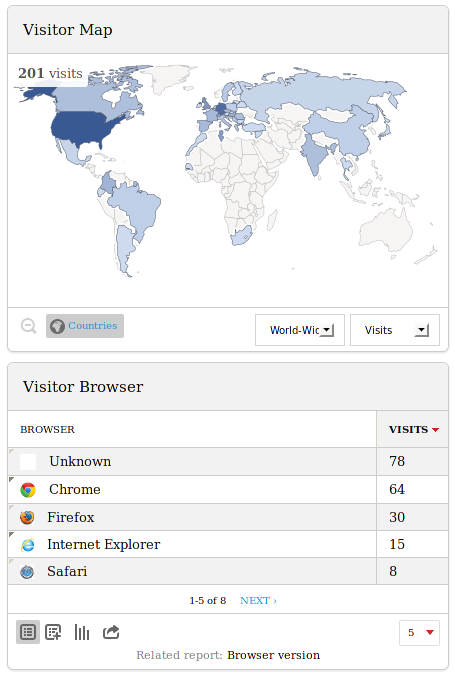 Open the Piwik dashboard in your browser, and you should now see a summary of the imported data, including the most popular streams (listed under Entry Pages), Visits by Server Time, Referrer Websites and a Visitor Map.